A team is so favoured that they take their minds off the task in hand and focus instead on a future opponent. Their current one, meanwhile, takes advantage. In certain circles, the Minnesota Vikings are being talked up as possible Super Bowl contenders. The Cleveland Browns are anything but. Winless and with a depleted roster, the Browns were without left tackle Joe Thomas for the finst time since December 31, 2006. Add No 1 overall pick Myles Garrett and cornerback Jason McCourty to the list, and surely there could only be one winner. But London, it appears, is a great leveller. For a half anyway. With Cleveland ahead 13-12 at the break, Minnesota’s superiority showed in the second-half, where they outscored the Browns 21-3. Backup quarterback Case Keenum took time to find his feet on the slippery Twickenham turf, but when he did, he threw for two touchdowns and an interception, completing 27 of 43 passes for 288 yards. 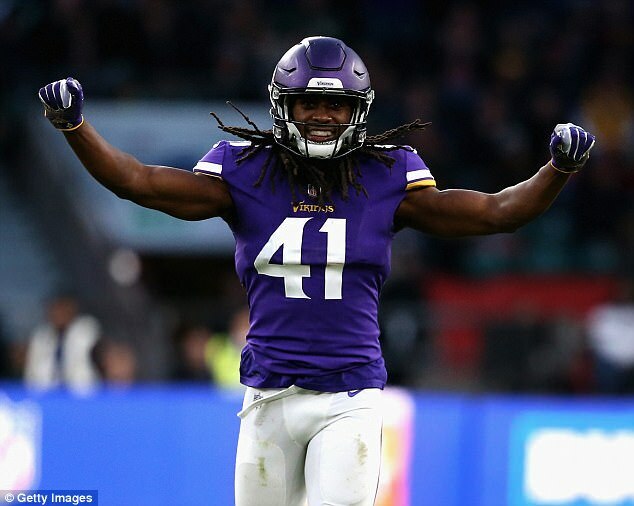 He was admirably supported by the Vikings’ much-improved offensive line and support from running back Jerick McKinnon and wide receiver Adam Thielen. 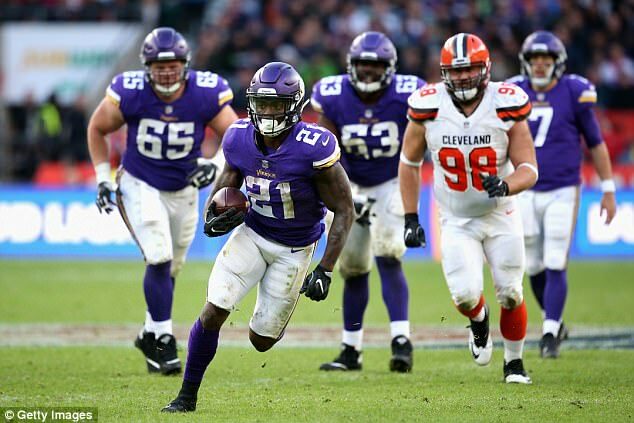 The Vikings were indebted to touchdowns from Thielen, McKinnon and tight end Kyle Rudolph, as well as four field goals from kicker Kai Forbath. Running back Isaiah Crowell and rookie quarterback DeShone Kizer scored touchdowns for the beleaguered Browns, who are 0-8 for a second-straight season. Exactly where that is is unsure, but for the Vikings their future is very much in their own hands. They lead the NFC North on 6-2 and with Green Bay Packers without quarterback Aaron Rodgers for the foreseeable future they are buoyed by the trip overseas as they head into the bye. ‘It really was an amazing few days we had here,’ said Zimmer. ‘Just going to brag on my players for a minute. Over at the hotel we stayed at, they’ve had four teams stay there. They came up to me and said this is the best, most well-mannered group they’ve ever had. They sit together they eat together, they hang out together. Say please and thank you. That’s the thing about trap games. You just have to win them.